Life - Tech - Sports - Health - Entrepreneurship - Cool Stuff - Etc. This condition began to show up around May of 2010 when my wife's feet would randomly swell, turn red, get hot to the touch and become extremely painful. She describes it as being lit on fire. It is actually considered one of the most painful conditions out there. It is also very rare, which is why we brought the diagnosis to our primary care doctor. And for us it was just one more problem on a long list of things that had happened to Tracey's health over the past few years. Had some time to kill and it looked refreshing. It is a regular fountain drink on the menu as well so it has free refills. It was inexpensive and refreshing with just the perfect hint of berry. I prefer mine unsweetened but you can add sugar if you would like. The combination of cost and refreshment was perfect. I love good iced tea. There regular black tea is also very good but this was the first time I've seen this flavor here. 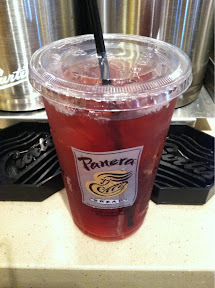 Where have you found good Iced tea?